The Dodgers hardly clobbered Corey Kluber, but it didn't matter. Dan Haren, who recently called his pitching in June "consistently mediocre," was consistently stellar tonight, pitching seven innings of one-hit ball against Cleveland. Haren retired 13 straight before being replaced in the eighth by Brian Wilson, who pitched a 1-2-3 inning. Kenley Jansen pitched a 1-2-3 ninth for the save. Offensively, the Dodgers scraped together a two-out run in the seventh on Clint Robinson's first MLB hit, which scored Andre Ethier, who had tripled to lead off the inning. That was all she wrote, and that was all they needed. 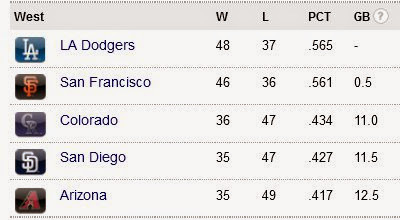 The Dodgers were most recently in first place on April 24. They'll start July in first place again. Is this the beginning of a beautiful summer? Dan Haren (7-4, 3.83) vs. Corey Kluber (7-5, 3.09). 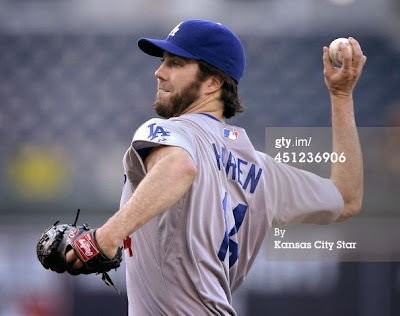 The Dodgers throw Dan Haren, a starter with a 7-4 record and an ERA in the 3s. So the Indians counter with a pitcher with almost the same win-loss record, also with an ERA in the 3s! Pretty Kluber move, if you asked me. 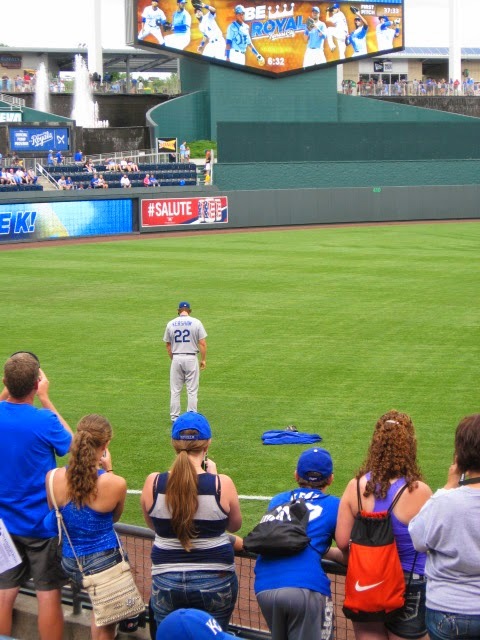 Haren is 2-0 with a 4.98 ERA in his last four starts, which doesn't bode well. Kluber has not lost to the NL, spanning six career starts (and a 2.29 ERA). With San Francisco idle and the Dodgers locked in a tie with the Giants for first place in the West, tonight's game determines whether we move into first alone, or lose our grip on first place after only one day. 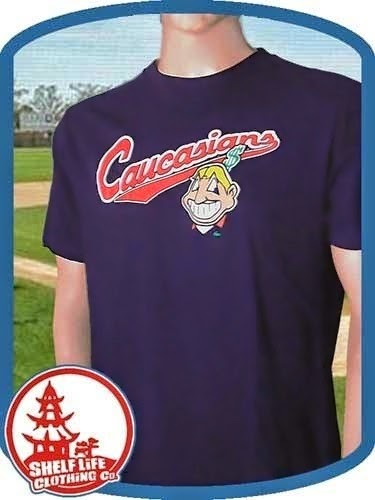 But rather than dwell on our NL West fate, let's make sure we're taking time to consider the racial insensitivity of our opponent's team name. 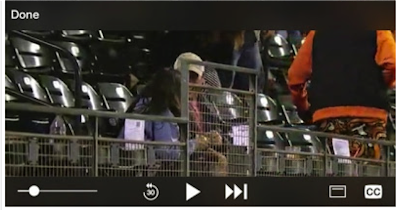 I mean, how else do you explain this fashion tragedy, from the Giants' extra-inning loss to the Reds late Saturday night (in which the Reds scored five runs in the top of the 11th, all with two out)? Didn't realize that the wardrobe from Do The Right Thing was still in circulation. His pants look like someone took a creamsicle to a blender and then wrapped it in a tiger's fur. My god, those pants are painful. No wonder why the Giants were swept at home by the Reds. "View down third base line." "Not really sure about this..."
"Gift from the French, obviously." "The scoreboard is really big. So is Carlos." "Just like the end of Ocean's Eleven." 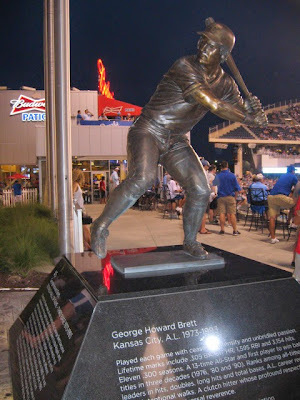 "I'm told George Brett was pretty good..."
"View from center field. Really nice 40-year old facility." Clayton Kershaw continued his hot streak, winning his sixth straight start and extending his scoreless inning streak to 28 innings, a career high. And what a June: as per the AP recap, "Kershaw went 6-0 with an 0.82 ERA in June, yielding four runs in 44 innings and striking out 61." The offense today came from many, starting with Adrian Gonzalez who used a bunt single to advance Yasiel Puig to second, and reach first base himself. Gonzalez' move came in the fourth when the Cards used a shift, dropping his bunt on the third-base side of the diamond where it was clear, and it ended up breaking Shelby Miller's no-hitter bid (come on, as Vin Scully said, it's the fourth inning for pete's sake; there's no unwritten rule-breaking here). Matt Kemp then singled in Puig, with A-Gon taking third on the throw; Juan Uribe sacrificed Gonzalez in for a 2-0 lead. Gonzalez added a RBI single in the fifth to make it 3-0. And Andre Ethier broke it wide open with a three-run HR to right later that inning, scoring Kemp and Gonzalez. 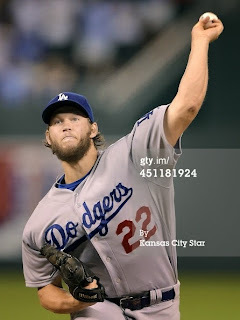 6-0 was all the cushion Kershaw needed to notch 13 Ks over 7.0 IP. Sure, Uribe's ninth-inning error ended the Dodgers' streak of nine straight errorless games, their longest in a decade. But it's all bubbles and dugout dancing for the Dodgers, who erased a 9.5-game deficit in only three weeks, and (thanks to events elsewhere like the Reds sweeping the Giants over the weekend) now sit back in first place in the NL West. Wow! 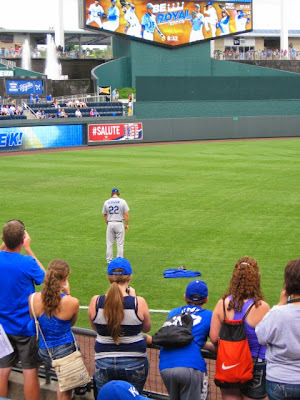 Clayton Kershaw (8-2, 2.24) vs. Shelby Miller (7-6. 3.75). Yesterday's 9-1 win, coupled with yesterday's extra-inning loss by the Giants (who have dropped 14 of 18), puts the Dodgers a mere one game out of the division lead. 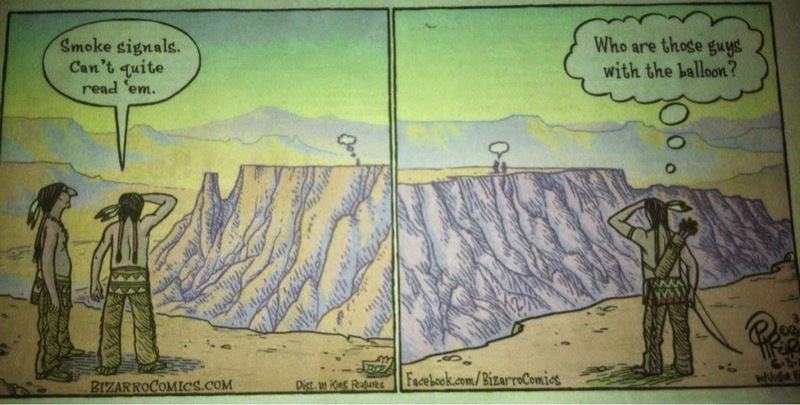 Which is truly remarkable, let's face it. Suddenly, the Dodgers are playing error-free ball even if no one can confirm these lack of errors on television broadcasts; meanwhile, the Giants are playing before their smallest home crowds in almost three years. With yesterday's win, the Dodgers will have only lost one series this month (June 2-4 vs. White Sox). The Dodgers' are making footsteps, and others are listening...and shaking. So there's no better person to start today than Clayton Kershaw, who has a 21.1 inning streak of scoreless innings, not to mention a beard that's getting crazily bushier each day. Kershaw was poised yesterday during the game, and there's no reason to think he'll get rattled today, even by a team that went 4-0 agagainst him last year (twice in the regular season, and twice in the NLCS). But at least he's healthy. 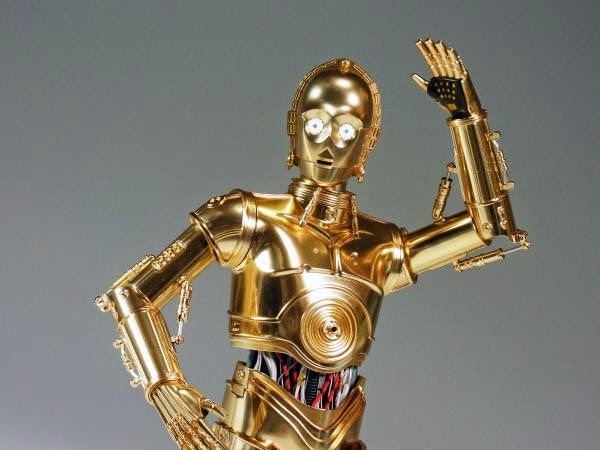 Miller, on the other hand, is coming off a truncated start in Colorado, where he was removed after 2.2 IP (3 ER, 5 BB) due to stiffness in his back. Still, his bullpen session Friday seemed fine, and I'm guessing the newly-married pitcher will probably be pretty nonplussed as he drives the parking lot circles while entering Dodger Stadium grounds tomorrow. Or perhaps I could put this, "Shelby: calm, and 'round the mountain"? That really doesn't make any sense, I know. 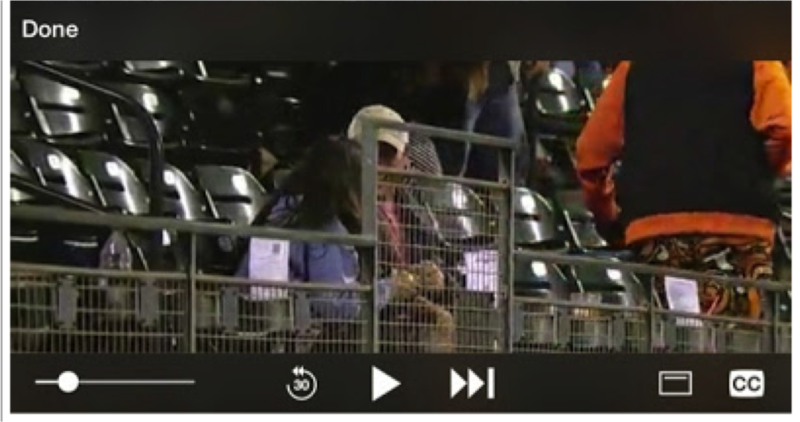 The video isn't as good as the MLB.com headline would like you to believe; Dan Haren and Josh Beckett don't start throwing sunflower seeds at Clayton Kershaw, during his in-game interview from the dugout today, until about halfway through (and even then, it's pretty tame). Still, it's a good chance to hear how poised and articulate this young man is, even under "fire". Your browser does not support iframes. Weep quietly. So glad that Clayton is on our team! Zack Greinke is back. 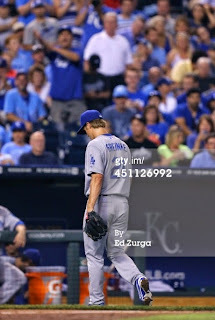 After a rough start last outing, Greinke came back with 10 Ks over 7.0 IP, giving up only 4 H and 1 ER (a solo shot by Matt Carpenter) while walking none. 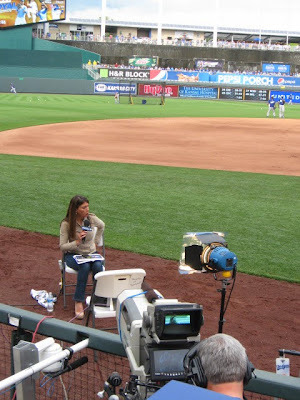 Just another dominating performance, on national television (with Eric Karros doing the commentary! ), no less. Rojas ground out (out #3). 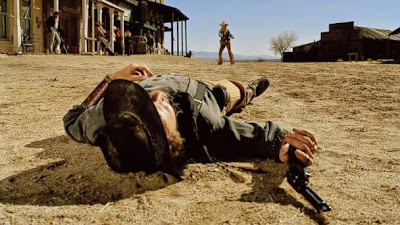 Throw in a couple more Ks from Paul Maholm in the eighth, and then another K in another shaky-as-hell ninth inning from Chris Perez, and the Dodgers have 13 Ks, a blowout victory, and their ninth straight errorless game. And I have to think the good defense correlates with the Dodgers' climb back to 1.5 GB the divisional lead. 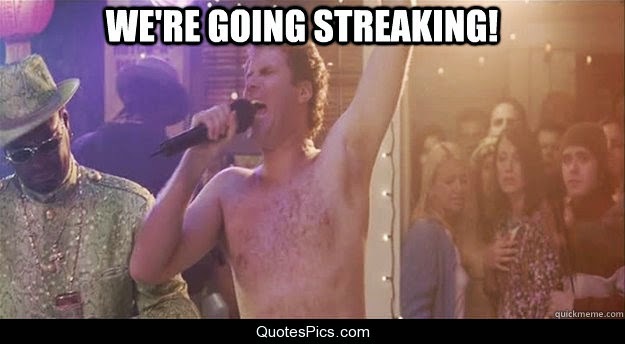 Dudes, we are STREAKING! And everybody's doing it. Possibility for four-game win streak: over. 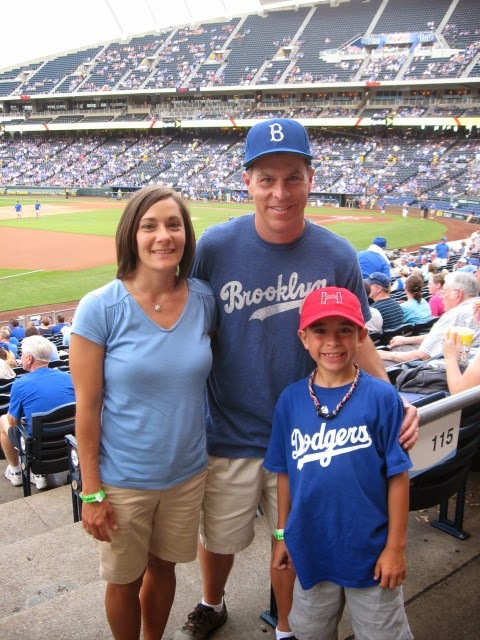 Let's get this one for Fred's Brim and Mrs. Fred's Brim, who welcomed the newest little Dodger to their family yesterday! At least the Giants lost again, so the Dodgers stay 2 games back. We'll take the small victories, I guess. 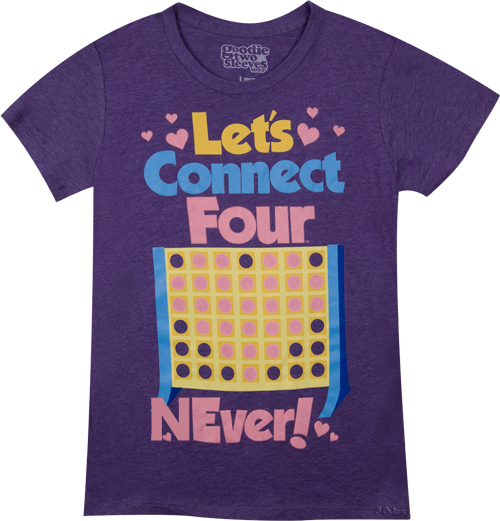 Just not four of them in a row. Hyun-Jin Ryu (9-3, 3.06) vs. Carlos Martinez (1-3, 4.33). 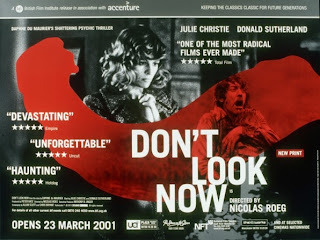 Don't look now — I SAID DON'T LOOK NOW! — but the Dodgers have won...three in a row. Dun-dun-DUNNNNNN. 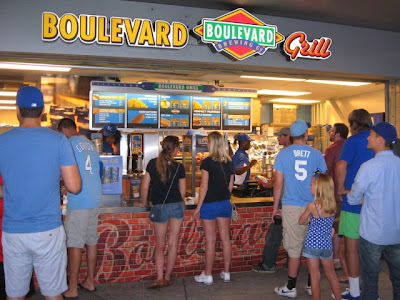 They've got the reliable Ryu on the mound versus the Cardinals' rookie spot-starter Martinez. They barely scratched out a run against Wainwright last night, but he's an outlier. 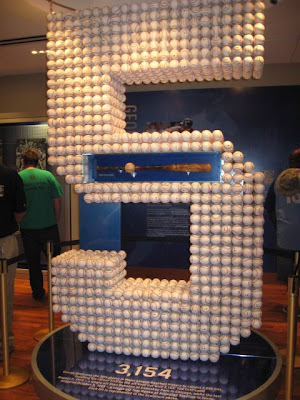 Let's not forget in their last homestand the Dodgers averaged more than five runs a game. 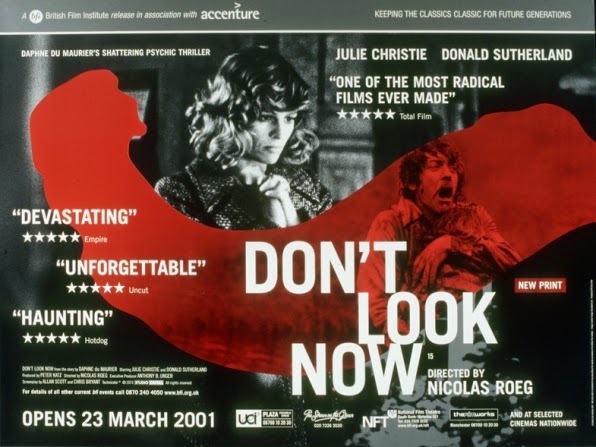 Don't look now — I SAID DON'T LOOK NOW! 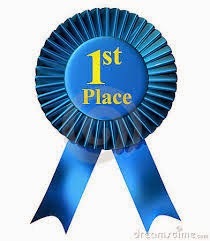 — but the Dodgers are the closest they've been to first place since the beginning of May. They're two games back of the Giants, who face the Reds' ERA leader Cueto tonight. If the Dodgers win, they'll go ten games above .500 for the first time this season. No pressure, boys! Dun-dun-DUNNNNNN. What's better than a baseball road trip? Winning the lottery. World peace, maybe. 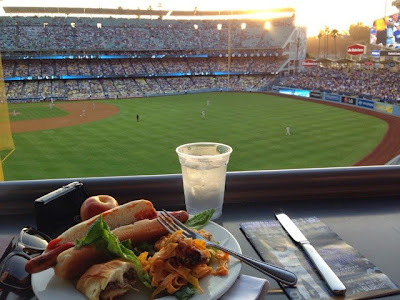 And the next best thing is getting a great write-up and photos from a loyal SoSG reader. Take it away, Steve "P. Diddy" Dittmore! 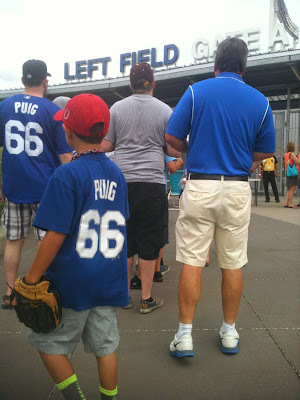 P.Diddy and fam made the 3.5 hour trek north from Arkansas to watch Los Angeles in Kansas City. We paid the extra $10 a head to get in early to watch batting practice and took up residence against the Dodger dugout for BP/autograph seeking. Lil P. Diddy, wearing his Puig shirt, got Figgins, Perez, and Ethier to sign his OMLB. 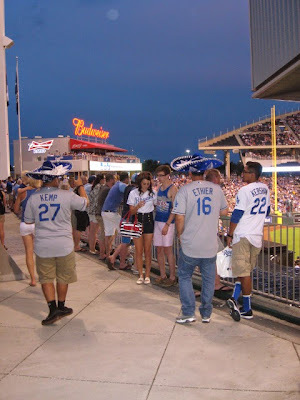 Romak (RIP) and Rojas signed quite a bit, as did Ethier (who did not start). Figgins was the best though. He must have signed 15 or more items. 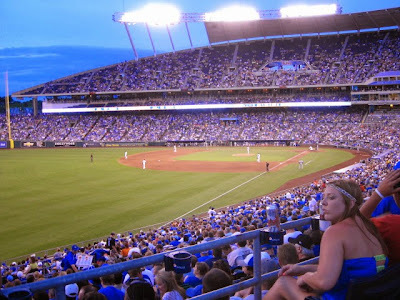 Kauffman is a great place to watch a game. 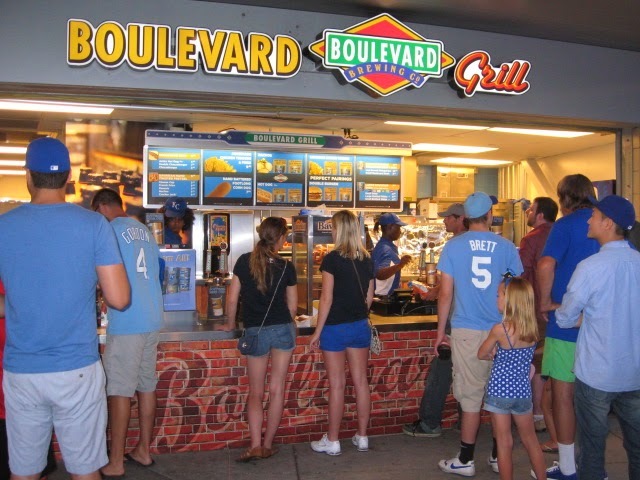 Lots of Boulevard beer on tap, good food and a huge kids area. 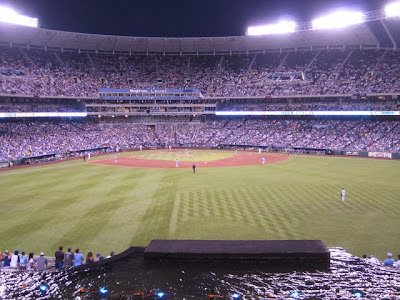 Easy to walk 360 degrees around the concourse with lots of standing areas, especially by the fountains. The Royals Hall of Fame and Museum is open until the 8th inning and feature the team's only World Series trophy and lots of George Brett memorabilia. 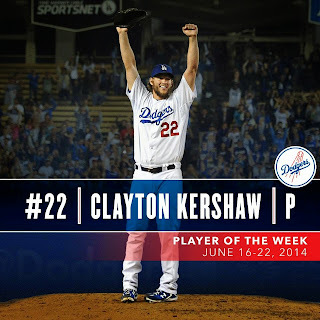 "Overall, a good day with a 2-0 win for Kershaw. With apologies for the photography, here are some highlights from our day." 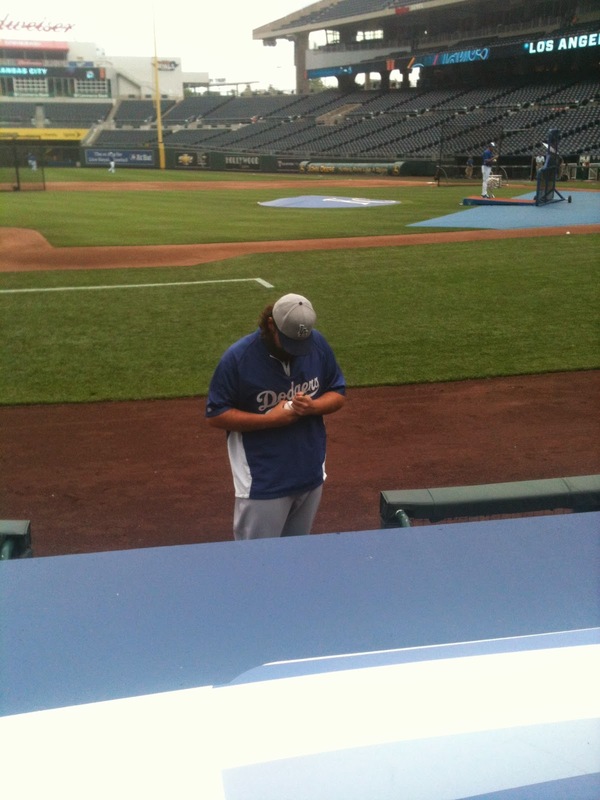 "Chris Perez signing Lil P. Diddy's ball." Thanks, Steve! More to come! Bottom of the second inning, no score, and the subject is Mike Matheny. 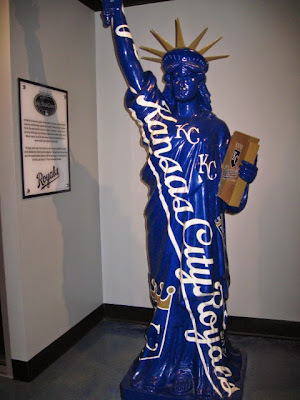 Matheny, forty-four years old come the end of September, born in Ohio, lives in Missouri. But he was not even eighteen years old and he came to the University of Michigan with a major-league dilemma. Earlier that summer, the Toronto Blue Jays had drafted the catching prospect in the thirty-first round, but Matheny decided to honor his college commitments — but he had a lot of doubt. Getting drafted was a dream come true, and if he waited til later on, the next time the offer would be less or not forthcoming at all. So, he was a young man, not eighteen, and a lot of pressure. Should I turn pro or go to college? 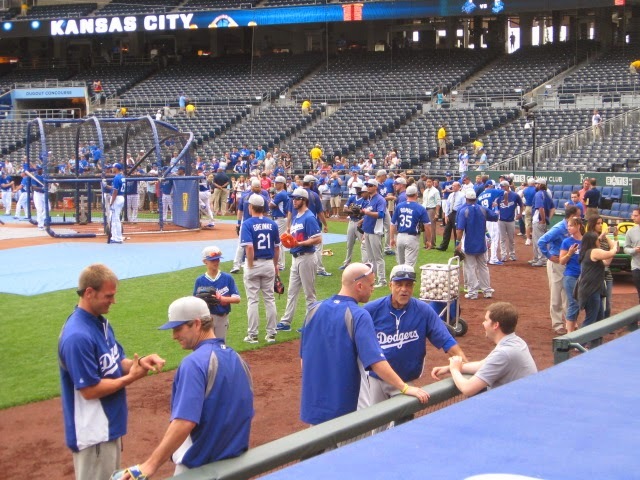 Major League Baseball rules allow players to sign with teams up until the player officially enters college full-time. That's the key, full-time. Anyway, Matheny showered, ready to go to class for the first day. Walked out of the dormitory, stomach knotted. And a pigeon defecated directly on his head. Now, conventional wisdom would suggest the bird bombing was a sign that he should hit the road, but Matheny had to go back and clean up. The pitch to Uribe a strike, oh and one the count. 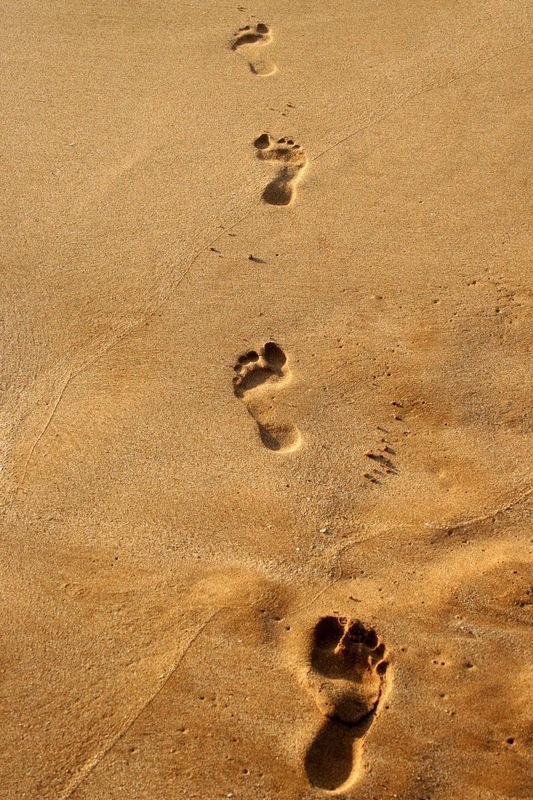 He went back, and showered, and cleaned up, and decided, all of a sudden, he was at peace. "I'm going to stay here. I'm going to go to college." And there was one other thing that happened. The strike-one pitch, swung on and missed, oh and two. Matheny went to his first class, and when he reached class, he noticed a pretty field hockey player named Kristin. And he would marry her, and live happily ever after. 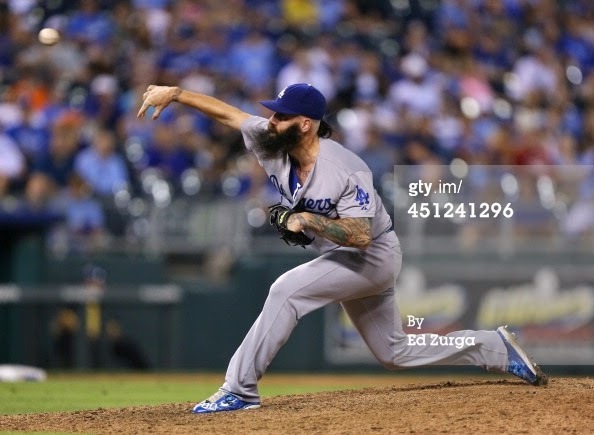 Brian Wilson just won his first game this year. On his own bobblehead night. That's weird. Josh Beckett just outdueled Adam Wainwright. Beckett went 7.0 IP with 0 ER and 4 H (2 BB, 4 Ks). 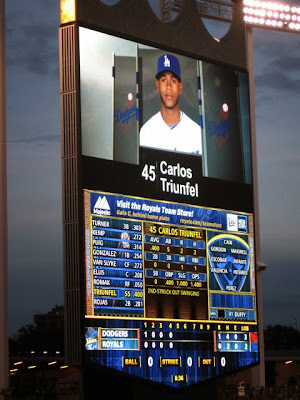 Wainwright succumbed in the eighth inning when Juan Uribe had a leadoff single, Drew Butera sacrificed Uribe to second, and Miguel Rojas and PH Justin Turner had consecutive singles to score Uribe. Wainwright, who didn't allow a hit until the sixth inning, settled down and struck out Dee Gordon and Yasiel Puig. But it was too late, the Dodgers had broken through with one run. 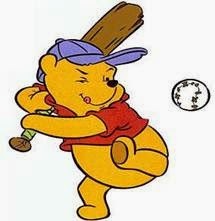 Don't really understand all this Uribe/Pooh stuff, but I'm going with it. Kenley Jansen came out for the ninth and struck out Nutshot, but then allowed a one-out single to Matt Adams, who was lifted for PR Peter Bourjos. However, Butera and Rojas combined to catch Bourjos stealing after Bourjos overslid the bag and was tagged out (a call that was upheld on review). The Dodgers had already benefitted from an earlier review call, when Matt Kemp threw home to catch Allan Craig at home for the third out in the top of the seventh. So a lot went the Dodgers way tonight...notwithstanding the outcome of the Reds @ Giants game up north. 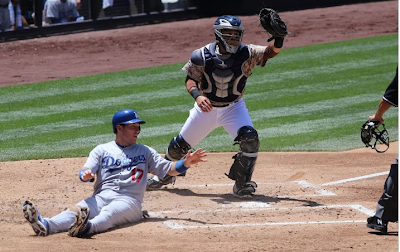 At the halfway point of the season, the Dodgers look to finally be getting some momentum?! We'll take it! Aw jeez, these guys again? At least Hanley's already hurt this time. It's worth noting that this has been promoted as a "great pitching matchup," which just goes to show how far Beckett has come. 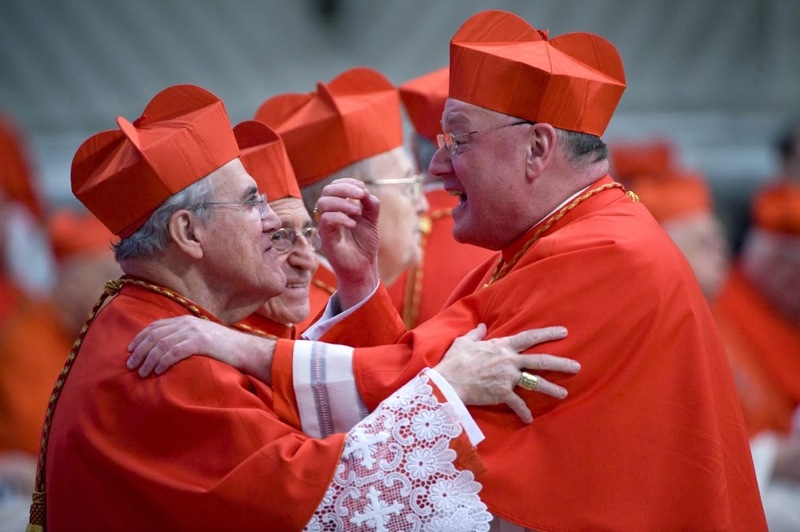 A couple months ago, it may have been described as "a horror show of a mismatch." 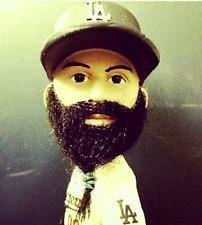 Oh, and it's weird hair-face bobblething night, too. Hooray. It was not a game you expected the Dodgers to win. In an interleague road game against a surging team of talented youngsters, Haren gave up a two-run lead in the fifth inning on a solo home run and an RBI single. Jamey Wright was responsible for 2 2/3 innings of scoreless relief, and the Dodgers loaded the bases with two out in the eighth. That was when A.J. Ellis channeled his inner Roger Dorn and took one for the team. The Dodgers took the lead on his RBI HBP, Howell and League got us to the ninth, and Donnie summoned Wilson for the save due to Kenley's recent workload. This being the 2014 Dodgers, there are no 1-2-3 saves. But with a runner on second and one out, this happened. It's a game of inches, as they say, and the Dodgers get out of town having gone 4-2 on the road trip. They still don't have a four-game win streak, but the Dodgers are starting to win some squeakers — every game on this road trip was decided by one or two runs. That's quality baseball! 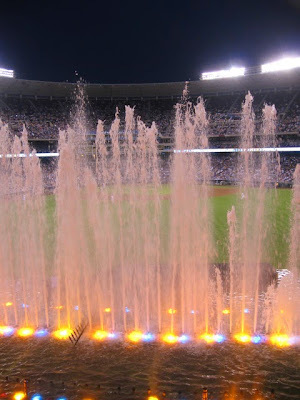 Dan Haren (7-4, 3.62) vs. James Shields (8-3, 3.70). Dodgers' record in June: 13-9. Giants' record in June: 9-12. Dodgers have gone from 9.5 to 3 games back within that span. The lesson here is clear: Always have Clayton Kershaw on your team. 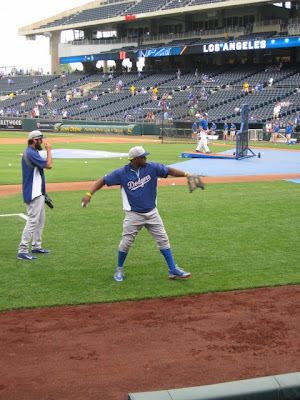 And apparently, they're going to have to do it without Hanley in the starting lineup today. As for Shields, let's let STATS LLC (via ESPN) tell the story: "Shields (8-3, 3.70 ERA) has gone 5-0 in nine starts since losing to Detroit on May 2, but he's posted a 5.54 ERA and allowed nine homers in his last six. He's benefited from 7.25 runs of support per game during the undefeated stretch." In other words, let's destroy that Shields and his offensive generator. BOOM! 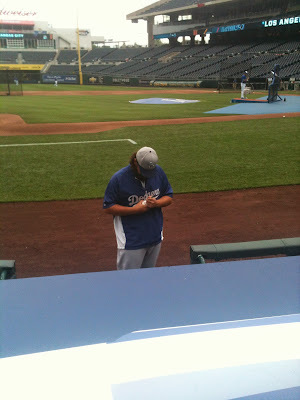 He's the gem of the Dodgers organization. He's the head of his own ambitious charitable organization. He's the highest-paid pitcher in baseball history. He's admired by fans of the enemy. And he's a stopper. What Clayton Kershaw did tonight was almost as hard as throwing a no-hitter: following it up with eight innings of shutout baseball. He worked with the slimmest of leads after AGon grounded into a first-inning fielder's choice, scoring Turner — who, batting leadoff, saw 19 pitches in his first two ABs. Wonder if Donnie will try that again? Dodgers win their first game at Kauffman Stadium. The Giants lost again. Three back, baby! One day, Mickey Mouse was getting ready to set sail on a long sea voyage. Minnie Mouse made Mickey a special teddy bear to take with him so he would never be lonely. Mickey loved the bear and named him Duffy. Mickey and Duffy sailed around the world. They visited all sorts of exciting places and made lots of friends along the way. Soon, however, Mickey (and Disney fans as a whole) grew tired of Duffy and cast him aside. He wandered the countryside, searching for a new home, before finally settling in Kansas City. 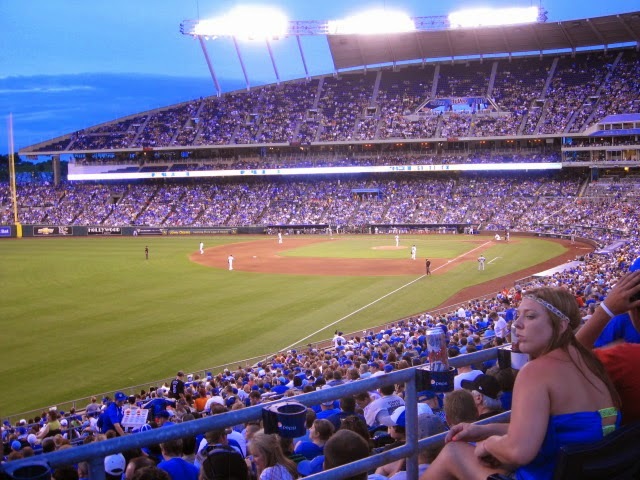 He now spends his days as a left-handed pitcher for the Kansas City Royals. 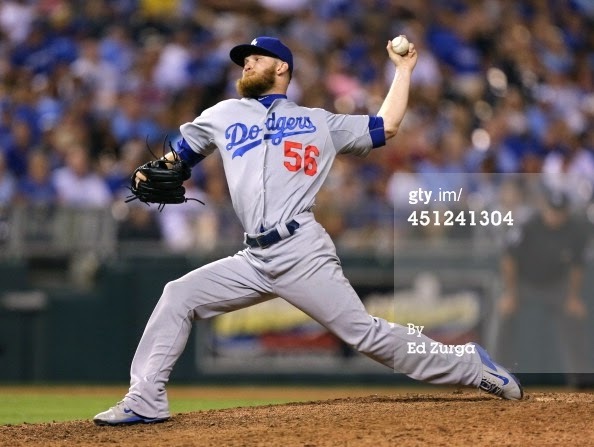 The Dodgers have a left-handed pitcher starting today, too. His story is still being told, but I hear it's shaping up to be a good one. 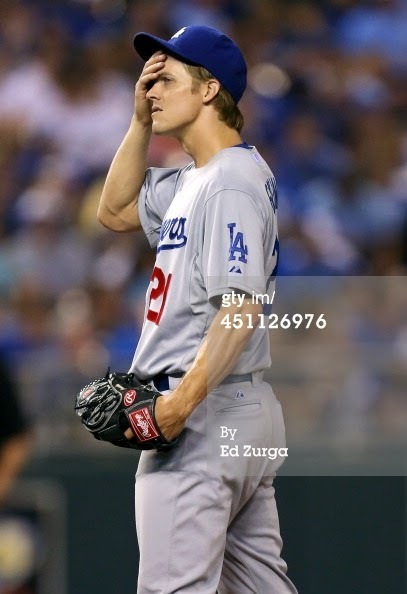 It was that kind of night for Zack Greinke. A different kind of Public Enemy No. 1. Greinke fooled nobody today, least of all Salvador Perez (solo home run), Jarrod Dyson (3 for 3, 2 RBI, R), Lorenzo Cain (RBI single) and Alcides Escobar (RBI triple). 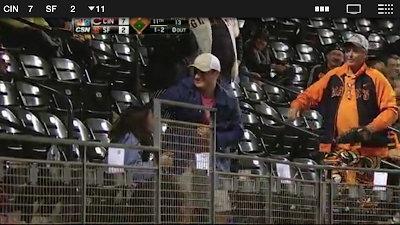 Zack left the game in the sixth inning to a smattering of boos, per the Twitters. 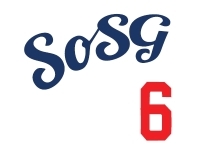 Down five runs by the sixth, the Dodgers, in true Dodger fashion, put a few runs up late (a two-RBI double by Hanley in the eighth and a solo homer by AGon in the ninth) to give Dodger fans a glimmer of hope. Then the team took that glimmer of hope, crumpled it into a tiny ball, and flushed it down the toilet. Fortunately, the Giants lost again, keeping the Dodgers a tantalizing four games back. Mr. No goes tomorrow for the Dodgers. 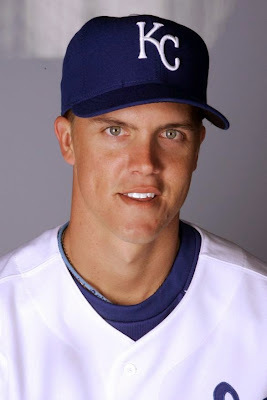 Was Zack Greinke's head smaller back then? Zack Greinke (9-3, 2.57) vs. Jeremy Guthrie (4-6, 3.86). And we're gonna play Royals. 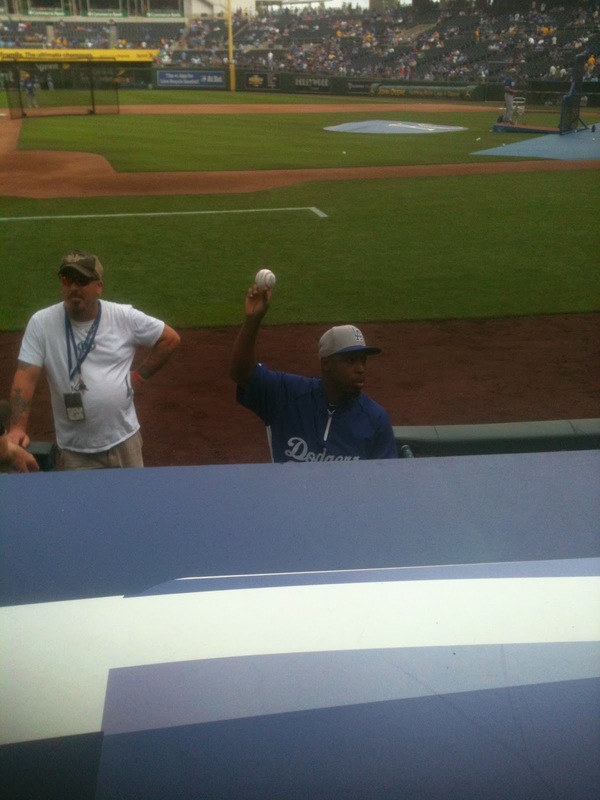 (*) We normally might be partaking, but, Juan Uribe is extending his rehab assignment in Rancho Cucamonga. 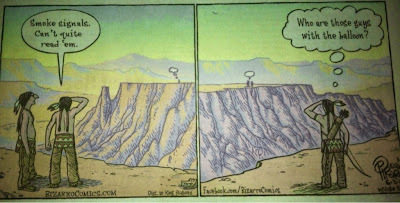 Kudos to "Argyle Sweater" comic strip artist Scott Hilburn for digging deep for the groanworthy pun, adding Honey where no Honey was needed, and realizing no strip is complete without a Vin Scully reference (although who would be talking to Vin on-air?). Also, it appears the Reds, Nats and/or Angels have a right-handed-hitting dog on their team. Denard Spaniel? The United States was seconds away from defeating Portugal on Sunday when Michael Bradley, normally one of the steadiest American players, mishandled a ball in midfield and gave Portugal a last opportunity. Silvestre Varela took advantage, scoring on a header. But the 2-2 draw was a result the U.S. might have been happy with before the match began. It improved the Americans’ odds of advancing to the knockout round of the World Cup. Those chances are up to 76 percent, according to the FiveThirtyEight forecast, an improvement from 65 percent before Sunday’s match. That 76 percent figure may even be slightly low, for reasons I’ll explain in a moment. Still, the U.S. will not be guaranteed advancement unless it manages at least a draw against Germany on Thursday in Recife, Brazil. If the U.S. loses, the Portugal-Ghana game, which will kick off simultaneously in Brasilia, could cause heartbreak for Americans. You may want to have two screens at your disposal for Thursday’s matches. The easy way. First, it could draw or beat Germany. That might not sound so challenging, but the Germans are the third-best team in the world, according to ESPN’s Soccer Power Index. Our forecast gives the U.S. a 14 percent chance of a win and a 22 percent chance of a draw — but a 64 percent chance of a loss. As a bonus, however, the U.S. will advance first from Group G if it beats Germany. That matters because the first-place team from Group G is likely to face Russia or Algeria in the Round of 16 — while the second-place team will face a stronger side in Belgium. The almost-as-easy way. Next, the United States could lose to Germany but advance if Ghana and Portugal draw in Brasilia. Our forecast puts the chance of a Ghana-Portugal draw at 29 percent. The hard way. Finally, the U.S. could lose to Germany but advance because it edges either Portugal or Ghana — whichever team wins in Brasilia — on goal differential or another of FIFA’s tiebreakers. Let's hope it's the easy way! The end of this play was not so good. The end of this play was also not so good. Like another one of today's games, this one went to 2-1. However, unlike other games, this one didn't end in a tie. After losing the opener by watching the bullpen crumble, the Dodgers settled down and secured wins late in both Saturday's "beat LA" game as well as today's matchup. With Hyun-Jin Ryu dealing six innings of four-hit, 1 ER ball (1 BB, 2Ks), the Dodgers notched a run in the first off of Adrian Gonzalez' fielders choice, and then got another in the second off of Dee Gordon's RBI single to right, which scored Scott Van Slyke from home but was nowhere close enough to score A.J. Ellis from second (Ellis, described as "lumbering" by Vin Scully on the call, was easily tagged out at home to end the inning). The two Dodgers runs held up, though, and the Dodgers took the game (and the series) and remain four back of the Giants. Meanwhile, in Manaus, the USMNT edged back from a 1-0 deficit to take a 2-1 lead over Portugal. But Michael Bradley got his pocket picked in the fifth minute of stoppage time, and Portugal scored the equalizer to end the game 2-2. A difficult result for the US team, which now looks to its final Group match against Germany to determine whether we advance to the knockout round. 2-1 is better than 2-2. I'm glad the Dodgers game didn't end up in a tie.